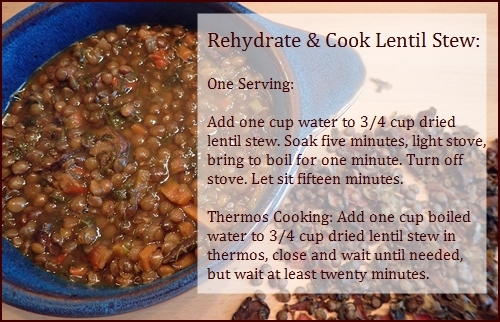 January 2017 Trail Bytes: Lentil Stew Recipe. For home or a night on the trail. A good place to start, when learning to cook a new recipe, is often the back of the package. Which brings me first to a confession and a pledge: I have been living mostly in Switzerland for six years and have not learned the German language. Why? Procrastination. (Always a good topic for the resolution-friendly month of January. I get by at the market with a limited vocabulary, but it’s time to get serious. So, I am making this pledge to begin in earnest. Today, not tomorrow. Carrot – Karotte, Leek – Lauch, Onion – Zwiebel, Bay Leaf – Lorbeerblatt, Garlic – Knoblauchzehe, Tomato Paste – Tomatenpüree, Mushroom – Champignon, Parsley – Petersilie, Lentils – Linsen, Stew – Dünsten. Food lables are written in German, French, and Italian. No English. Here are the indgredients and instructions for making lentil stew translated into English with a few minor changes: (I used one diced tomato instead of tomato paste, added one bell pepper, and omitted sour cream). Lubricate a stock pot with half a tablespoon of olive oil and cook vegetables and bay leaf (except the mushrooms and parsley) for ten minutes. Start with the leeks and onions, then add the rest. Add lentils and cook another five minutes. Add liquid bouillon and bring to a boil. Reduce heat to low and simmer for thirty minutes, covered. In a separate pan, minimally lubricated with half a tablespoon of olive oil, cook sliced mushrooms and chopped parsley. Add two teaspoons of balsamic vinegar and a splash of wine if desired. Add cooked mushrooms to cooked lentils in stock pot and simmer another five minutes. Remove from stove and serve, or allow to cool for dehydration. Spread stew on dehydrator trays covered with non-stick sheets. (I used three Excalibur Dehydrator trays for this recipe. 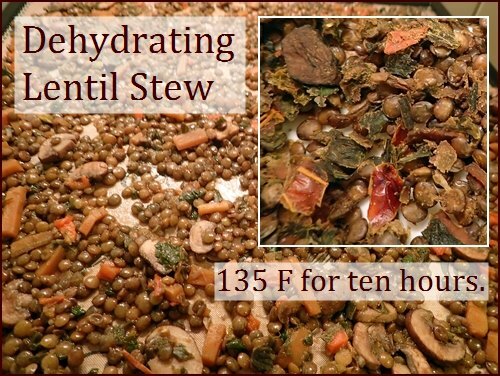 Dehydrate at 135° F for approximately ten hours until all components of the stew are dry. Hint: check the mushrooms to make sure they are dry on the inside. A good serving size for one person is ¾ cup dried stew (approx. 80 grams). Rehydrate and cook with one cup of water. I prepared mine in a pot on the stove as well as in a thermos with good results. Green lentils remain firm and chewy when cooked. There was no difference in firmness after dehydrating and rehydrating. A note on color: The green of the lentils, (more like brown) and the stew-making process in general, robbed most of the color from the carrots and red bell pepper. For a more colorful trail meal, dehydrate additional vegetables separately, and add them to the meal. A few more carrots, red or yellow bell peppers, and possibly a few cubes of sweet potatoes would add nice color. That’s it for this month. I hope the lentil stew recipe warms you. January was snowy and cold here in Switzerland. Our Lake of Pfäffikon froze, but not thick enough to skate on. It takes Dominique and I about three hours to walk around the lake, which we do most weekends. As always, we wish you all the best with your adventures and food preparations. Click to purchase my backpacking cookbook, Recipes for Adventure. Thank you!